Fashionably grim futures. Visceral firefights in war-torn ghettoes. High concepts that devolve into low spectacle. There’s no mistaking the handiwork of South African “visionary” Neill Blomkamp, who builds films that are distinctly his own—heavy-handed in their metaphoric messages, fetishistic in their deployment of military hardware—from the scraps and spare parts of ones that are not. But if anonymity is the enemy of artistry, is there also such a thing as being too much yourself? Blomkamp, an action junkie careening clumsily through the arena of cerebral sci-fi, should sue himself for plagiarism. 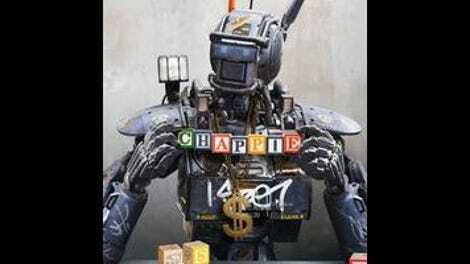 His latest, Chappie, was originally described as a change-of-pace “comedy thing” for the writer-director. Perhaps the word Blomkamp was actually searching for was “self-parody.” Like Elysium, this rusty A.I. story is basically just District 9 with a new coat of paint; it’s distinguished only by the jabbering, irritating personality of its title character. Set in 2016, when gang culture will apparently start taking its fashion cues from Tank Girl, Chappie transports audiences to a Johannesburg not much different from the one they visited in District 9. (Blomkamp even introduces the world in the same way, with a mockumentary framing device that he again abandons almost immediately.) Instead of CGI space bugs, the city’s slums are invaded by CGI androids—a sleek line of fully automated officers with Etch A Sketch faces and adorable metal bunny ears. 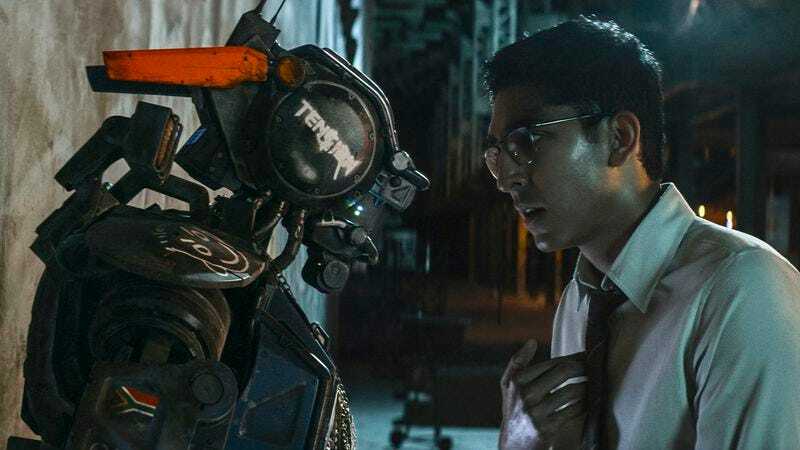 One of their programmers, Deon (Dev Patel, doing multiplex double duty this week), would rather chase the secret to sentience than build “robot pigs.” So after cracking the consciousness code, he grants a damaged droid the gift/curse of true artificial intelligence. Unfortunately, his impressionable machine quickly ends up in the hands of gangsters (two of the three played, flamboyantly, by the South African rap duo Die Antwoord, or Yo-Landi Visser and Ninja), who dub him Chappie and begin teaching him how to talk trash, walk cool, and handle weapons. Brought to life through what the filmmakers have described as a “poor man’s motion capture,” Chappie is a marvelous special effect, at once entirely lifelike in his movements and totally credible as an assembly-line product. (Blomkamp is nothing if not a master of cosmetic design.) As a character, the ’bot is more off-putting—a childlike idiot savant prone to fits of rage and voiced, with a cloying singsong accent, by Blomkamp’s leading man of choice, Sharlto Copley. There is a certain integrity to his mechanized angst: More parenting parable than treatise on the nature of consciousness, Chappie presents Chappie as a product of his environment, indoctrinated into the spiritual beliefs of his “mother” (Visser) and discouraged from playing with dolls or painting by his macho “father” (Ninja), with Deon as the absentee “real” parent to be rebelled against. Is the film equating growing minds to hackable software, susceptible to the human errors of their programmers/guardians? As with his last two features, Blomkamp flirts with big ideas, but loses interest in them when the loud toys come out. Structurally, Chappie follows the same model as its predecessors, putting a hunted hero in the crosshairs of competing parties over a compressed period of time. There is, again, a bellowing lowlife kingpin to be violently eliminated, and an icy company woman, à la Jodie Foster’s oddly accented Elysium heavy. (The bigwig is played this time by Sigourney Weaver, who seems to have found a second career as a cameo accessory, strengthening the sci-fi bona fides of various projects simply by reminding audiences of the Alien series.) The most substantial of the villains is a bitter rival engineer (Hugh Jackman) whose remote-controlled robot, The Moose, is a dead ringer for the ED-209 from Robocop. The constant nods to that genre classic only make one long for the satirical wonders Paul Verhoeven might have worked with this material. Blomkamp climaxes his movie the only way he knows how: with a hail of gunfire, a splattering of bodies, and a feverish chase from arid warzones to sterile corporate interiors. More of his pet obsessions pop up in the backstretch, when a transformation into The Other again rears its head and a character pulls a feat of deus ex machina coding even more absurd than the one in Elysium. All of the filmmaker’s strengths and weaknesses are on full display; he remains a wizard at world building, while getting stuck again on the learning curve of actual storytelling. Those not fazed by the diminishing returns of Elysium may continue to be unfazed as the returns diminish further here, though even the diehards may struggle to warm to the slang-slinging mascot hero of this District 11. Bring on the Alien sequel already. At best, it may force Blomkamp to finally rewrite his own programming. Plus, you know he’ll have a ball with the Caterpillar P-5000.